Do you love refrigerator cake? 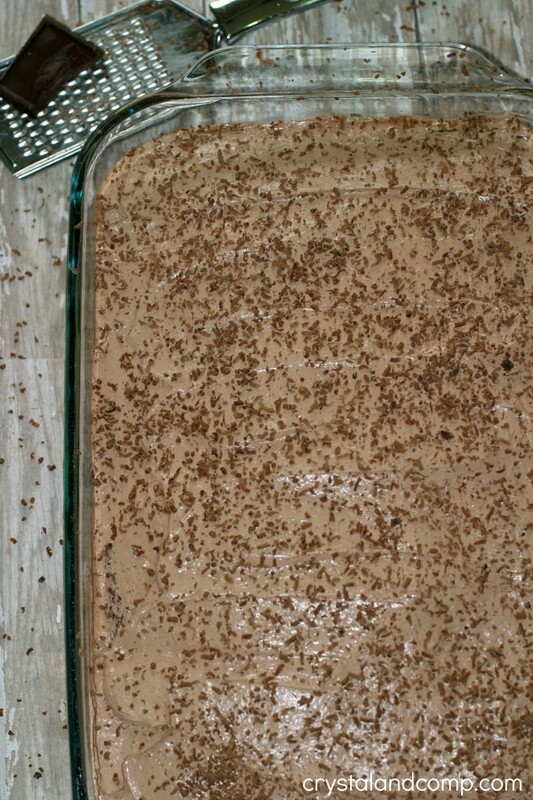 I have an awesome strawberry refrigerator cake recipe here on my site that is to die for. It is a family recipe from my friend Kim. 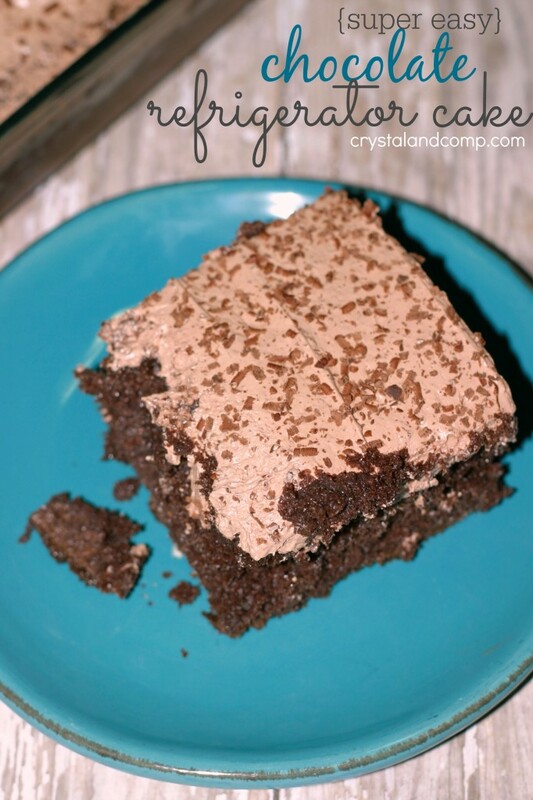 Well, I wondered how easy it would be to make a chocolate refrigerator cake. My family loves chocolate (well, everyone except Nick… crazy I know!). 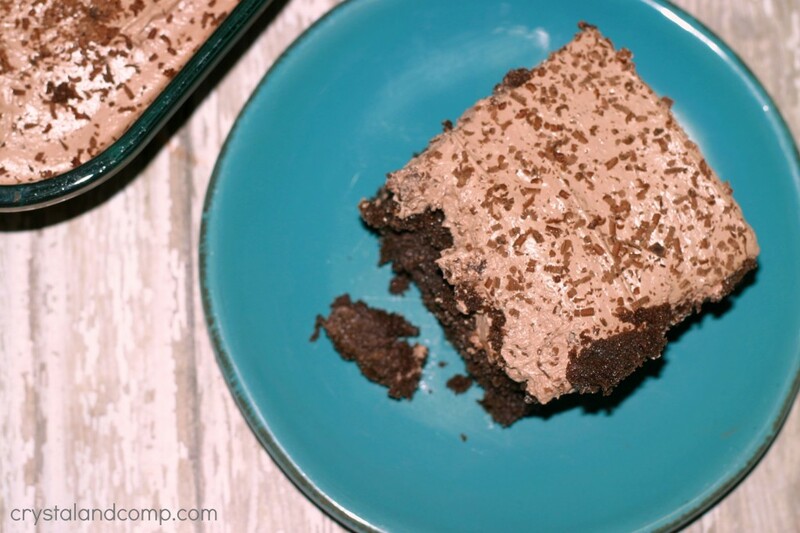 This recipe is super easy and so delicious! Wait until you see what I pour over it. Scrumptious! Prepare the boxed cake mix as directed on the package. Once it is done cooking, set it out to cool 100%. Use the end of a wooden spoon and poke holes throughout the cake. 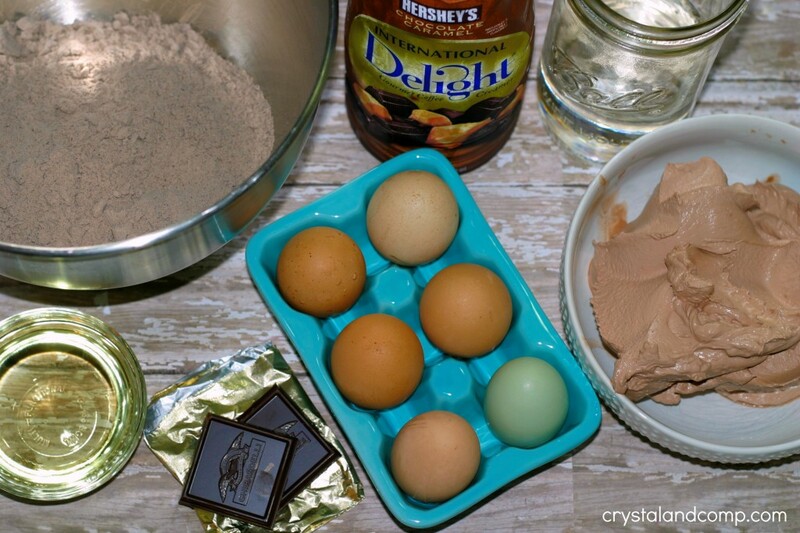 Pour 1 cup of the coffee creamer over the entire cake. I used International Delight’s Chocolate Caramel. Oh, this stuff is amazing! The creamer will seep into the holes. Once it as soaked into the cake, you are ready to ice it. Evenly cover the cake with the chocolate Cool Whip frosting. This is found in the freezer section next to the regular Cool Whip. 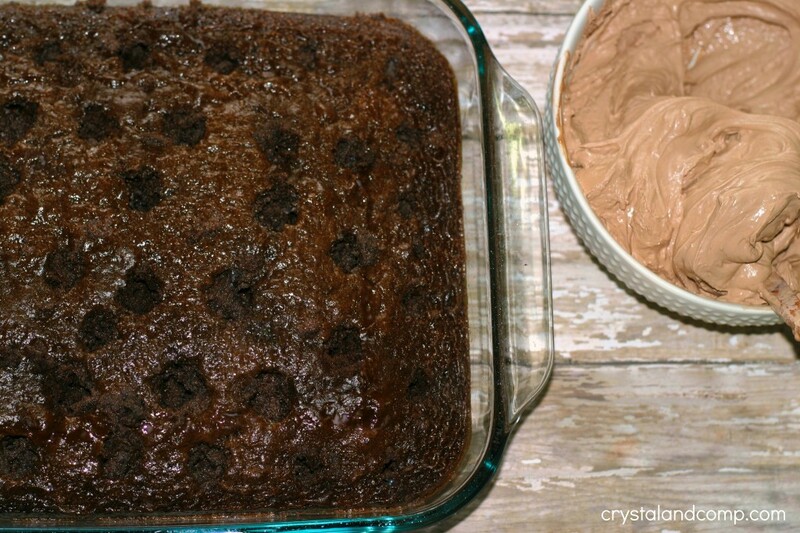 Use 1-2 chocolate squares and grate them over the icing. Cover the cake and pop it in the fridge for 2-3 hours so all of the flavors can come together. Slice it up and devour. Perfect after dinner dessert, after church snack or just because. 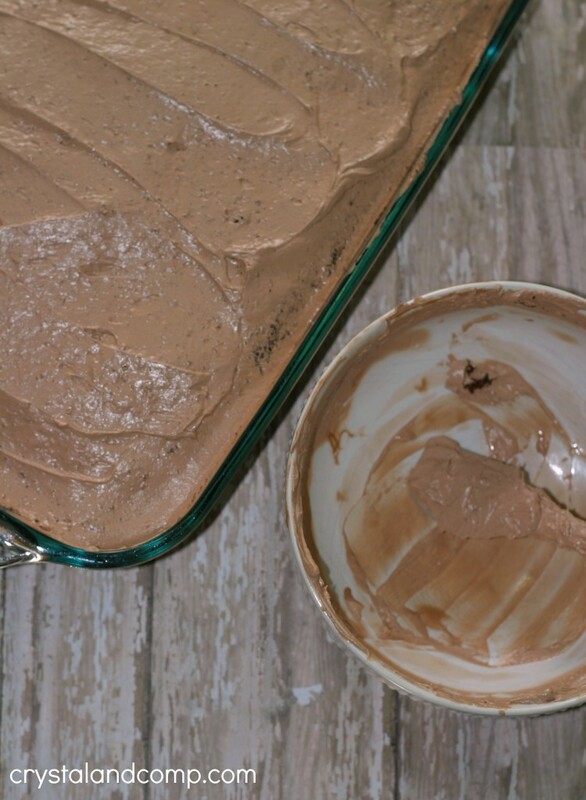 How to make a Chocolate Refrigerator Cake using International Delight's Chocolate Caramel coffee creamer. Prepare the boxed cake mix as directed on the package. Bake accordingly. 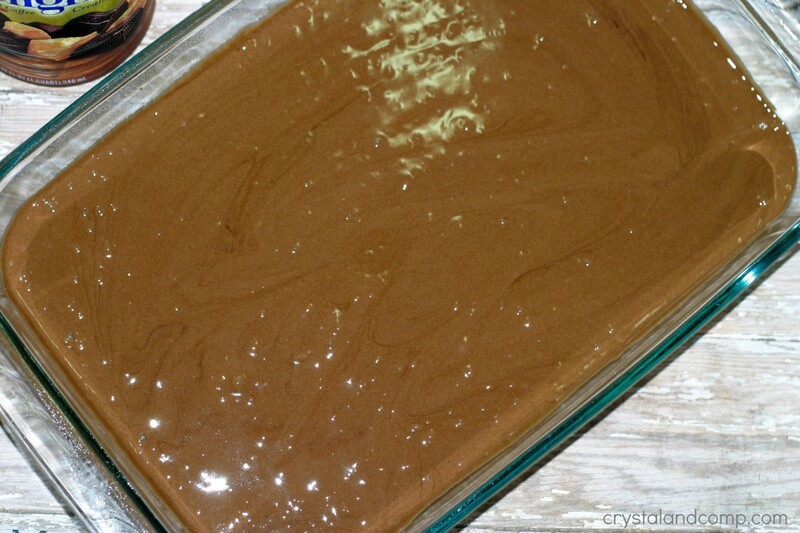 Pour 1 cup of the coffee creamer over the entire cake. I used International Delight's Chocolate Caramel. The creamer will seep into the holes. Once it as soaked into the cake, you are ready to ice it. Thanks for linking up with the Caffeinated Crafters! it looks so yummy! i love chocolates! Coming from Mummy Mondays!